"For affliction does not come forth from the dust, nor does trouble spring up out of the ground; man is born unto trouble as the sparks fly upward" (Job 5: 6 – 7). For six thousand years mankind has known very little joy. True happiness has been elusive and fragmentary. The history of the human race is more accurately characterised by "trouble," wars, gloom, sickness, death and endless tribulation of every sort. Job was certainly not alone in his suffering, both mental and physical, for suffering is universal. Yeshua (Jesus) said, "In this world you will have tribulation… but be of good cheer; I have overcome the world." (John 16:33). All trouble originates from the sin of Adam and Eve and the curse that God imposed on the whole earth at that time, including even the world of nature (Romans 8: 22). But all of the trials and tribulations that this world has ever experienced will be insignificant when compared to a unique seven year period of a time yet to come. This period is referred to by the prophet Daniel as the "seventieth week" Daniel 9: 24 - 27. The description given to it by many of the writers of the Bible are so awesome, they defy the imagination. There is no precedent for it. It is unparalleled in all of history. Therefore, the descriptive terminology from the Bible itself becomes the best, method to sketch this future seven year span of time. Yet even the ancient prophet’s descriptions, grievous as they are, are totally inadequate to fully understand those horrendous days. During the second half of this seven year period, also known as the great tribulation, God’s judgement will fall on the ungodly and unrepentant, who will blaspheme His holy name all the more, even in the midst of their suffering. But, the Body of the Messiah (church) will be spared from the wrath from heaven, since they have been caught up in the rapture just prior to the tribulation. Preceding the outbreak of any war, the "Ambassadors" are all called home, since no government ever attacks until its "Ambassadors" are secured, and since we all are "Ambassadors" for Christ. We will be called "home" before He settles His controversy with the nations. This second half of the seven years is also known as the "Time of Jacob’s Trouble," and sadly a severe time of testing for the Jews. God has a two fold purpose for this "seventieth" week of Daniel which will burst upon the earth with great ferocity. His first purpose is to bring "salvation" to Israel. His second purpose is to bring judgement on an unbelieving and rebellious world that refuses to repent of their sin. As believers in the Messiah of Israel, we must face up to our responsibilities regarding the Jewish people. The first step is to understand what is going on ~ and why the ongoing conflict in Israel is so crucial. Fortunately, God has not left us in the dark. The words of the prophets, recorded in Scripture thousands of years in advance, give us the light that we need. Why is this time called "the time of Jacob's trouble"? Is there a parallel between what is taking place today in Israel and what happened to the Jewish people's forefather Jacob, when he returned to the Land of Promise? Yes, there is! In the story of Jacob, God has given us a clear picture of what is happening to His people today, and also of what will soon take place. Jacob was the son who had the blessing and promise of God. But it was not until he returned to his homeland that he fulfilled his destiny. After a life-changing encounter with God, Jacob the "heal grabber," became Israel, "Prince with God." The return of Jacob from serving under Laban, is a prophetic picture of what will happen to Jacob's descendants in the end times. Just like the return of Jacob ~ the dream and vision of Theodore Hertzl for a Zionist State in The Promised Land, started the modern day Zionist movement that has brought the Jewish people back to their land. Both have been the result of increased insecurity, caused by jealousy and hostility from the people around them in foreign lands. Nothing ~ is a coincidence when it comes to Israel! Nothing ~ happens to His people without the permission of the Shepherd of Israel! But this Shepherd is different; He laid down His life for His sheep, the lost sheep of the House of Israel. The resurrected Shepherd will gather His sheep again and this time they will know His voice and come to Him. The Bible says that "He who watches over Israel neither slumbers nor sleeps" (Psalm 121:4). Both the Bible and history tell us that God is behind the return of the Jewish people back to their own land in our day. He is the number one reason why the modern State of Israel exists today! He said in Micah 4:6 - 7, "'In that day,' declares the LORD, 'I will gather the lame; I will assemble the exiles and those I have brought to grief. I will make the lame a remnant, those driven away a strong nation.'" Immediately, after Jacob had left an upset and angry Laban and having burnt all the bridges behind him, the angels of God met him. When Jacob saw them, he said, "This is the camp of God!" So Jacob named that place Mahanaim (Genesis 32:1-2). "Mahanaim" means two hosts or two camps. Today two armies are actively and intensely involved in the return of the Jewish people back to their own land: the angels in heaven and the prayers of believers who love Israel and understand the significance of what is taking place today in the Middle East. No Peace without God! Esau held a grudge against Jacob because the blessing his father had given him. He said to himself, "The days of mourning for my father is near; then I will kill my brother Jacob" (Genesis 27:41). The Bible says that Jacob sent messengers ahead of him to tell Esau that he only wanted to live in peace with him (Genesis 32: 3 – 5). This is so much like Israel today, just as God had a plan for Jacob; He also has a very special plan for Israel today ~ He is after their hearts! No matter how hard Israel tries, the Palestinians and Arab nations are never going to make real peace with them, until the Jewish people have met "face to face" (Peniel Le Peniel) with Yeshua as their Messiah, and been changed by Him (Genesis 32: 30). What a day that will be! Neither religion nor politics is the answer. God himself is the only answer to Israel’s peace problem today! The Bible says that Esau was coming out to meet Jacob with four hundred men. Four is the number of the earth and also of the flesh. The number 400 is often mentioned in the Bible in connection with military might (Judges 20:2, 1 Samuel 22:2; 25:13; 30:10). "O God of my father Abraham, God of my father Isaac, O LORD, who said to me, Go back to your country and your relatives, and I will make you prosper, I am unworthy of all the kindness and faithfulness you have shown your servant. I had only my staff when I crossed this Jordan, but now I have become two groups. Save me, I pray, from the hand of my brother Esau, for I am afraid he will come and attack me, and also the mothers with their children. But you have said, I will surely make you prosper and will make your descendants like the sand of the sea, which cannot be counted." This was the start of a time of Jacob’s trouble ~~~ Jacob’s heart began to soften from the heat of the fire that he is going through. He sent the people ahead of him with generous gifts to his brother Esau. But Jacob was still afraid! Jacob's real problem was not with man, but with God. He had spent twenty years in a foreign land with the promise of God over his life, but there was still something unsettled between him and God. Now the hour of reckoning had come. Nothing requires more vigour and unceasing exertion than wrestling. It is an emblem of the true spirit of faith and prayer. Jacob kept his ground; though the struggle continued long, this did not shake his faith, nor silence his prayer. He will have a blessing, and had rather have all his bone put out of joint than go away without one. Jacob name signified being a "deceiver" ~ but from now onwards he shall be celebrated, for true valour. Jacob‘s new name, "Israel" meaning a prince with God; a name greater than those of the great men of the earth. Having power with God, he shall have power with men too; he shall prevail, and gain Esau's favour. 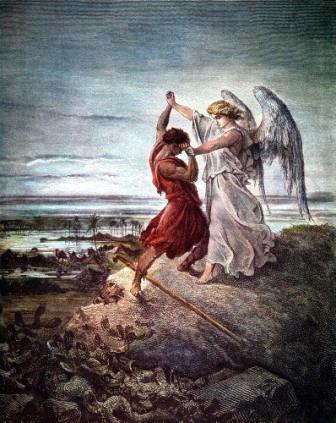 Jacob names the place of wrestling "Peniel" and obtains the favour of God. It is the same with the Jewish people today. Just as Jacob spent twenty years serving Laban, so the Jewish people have begun to return after twenty centuries scattered among the nations. Just as it was with Jacob, something is still unsettled between them and God. Never has God forsaken the Jewish people, when their hearts were turned towards Him. Their Messiah will come down to rescue His people Israel and do mortal combat with her enemies who are also His enemies, for the day of His vengeance will come, and who will be able to stand (Isaiah 59:20; 63:1 – 4; 34:5 – 6). The final outcome is secured! And so all Israel will be saved, as it is written: "The deliverer will come from Zion; He will turn godlessness away from Jacob. And this is my covenant with them when I take away their sins." (Romans 11:26-27) During this time, Israel will have come to a saving knowledge of Yeshua as Messiah, and as a nation they will begin to call out to Him to return and save Israel. At that time, surviving Israel will see the return of the Messiah, the second coming of Christ. The verse in Romans 11:29; Paul is talking about Israel, when he says, "For the gifts and the calling of God are irrevocable." Replacement theology, which says that the Church has taken the place of Israel, is incorrect as it undermines God’s character of faithfulness, goodness and mercy. This wrong teaching also ignores what Paul says in Romans 3:34, "What if some did not have faith? Will their lack of faith nullify God’s faithfulness? Not, at all!" And Paul’s statement in Romans 11:12 confirms that, "God did not reject his people whom he foreknew." God knew even before He chose Israel that they would fall. Make no mistake about it! God has never taken away or changed his call, plan or promises for the Jewish people! Israel’s greatest tragedy has always been her refusal to recognize her Messiah when He cam the first time. Yeshua (Jesus) said that Israel would suffer because of this (Luke 19:44 and John 8:24). But, this great tragedy that He came unto His own and they did not receive Him will not be repeated at His Second Coming. The Messiah will offer Himself again to His own brethren, the Jews, and this time they will know Him and will mourn for the Savoir they spurned. Probably this will occur at the dawning of the third millennium, after an absence of nearly two thousand years from their homeland, when they will again see Yeshua as their Messiah and King (Matthew 23:39 and Hosea 5:15; 6:3). We know that one day with the Lord is as a thousand years and a thousand years is as one day (2 Peter 3:8). Israel rejected her Messiah almost two thousand years ago and has been spiritually dead since, but if this comparison rings true she will rise again on the morning of the third millennium. Indeed, Yeshua (Jesus) rose on the morning of the third day, as well as the prophet Jonah was vomited out of the great fish on the third day. Similarly on the third day of the journey up to Mount Moriah, Isaac was dramatically saved when the angel of the Lord interrupted his father Abraham in the act of slaying his only son, believing that God would raise him from the dead. These three types of Israel: Yeshua (Jesus), Jonah and Isaac, all of whom experienced resurrection on the third day, may signal the imminent resurrection of Israel. (1) Joseph ~ In Genesis 45: 1 – 15, here we see the man in power and glory, the man before whom the knee had to be bowed and the Reveller of Secrets. And, when his brethren came the second time, he made himself known to them. There he stood dressed in his royal robe and royal authority. Before him eleven trembling men, hungry in rags and terror stricken and now he begins in the tenderness of his heart to weep and says… "Come near to me… I am Joseph your brother, whom you sold into Egypt… then he kissed all his brethren and wept upon them." Blessed type; of what it will be when the Messiah comes the second time and will forgive them their sins and remember them no more. (2) Moses ~ when he came the first time to his brethren to deliver them, they rejected him. And the second time, forty years later when the tribulation had risen to its greatest heights, they received him and he led them forth; we read this in Exodus chapters 2 and 5. (3) In the New Testament we have a type in unbelieving Thomas ~ because of his absence when the Lord first appeared to His Disciples after His Resurrection, he (Thomas) declared, "except I shall see in His hands and put my finger into the print of the nails, and thrust my hand into His side, I will not believe (John 20:25). And, after eight days again Yeshua’ (Jesus) Disciples were within, and Thomas was with them. Then Yeshua came, the doors being shut and stood in the midst of them, and said, "Shalom (peace) be unto you." Did He now condemn Thomas for his unbelief? NO! He let Thomas feel His wounded hands, feet and side for himself and said "Be not faithless, but believe!" Thomas answered Him: "my Lord and my God." Surely this is what it will be again when they (His brethren the Jews) who knew Him not will behold him, the pierced one. Can God ever forget His people Israel? Is it possible that these marks are the nail prints in the hands of Yeshua (Jesus), that He will carry throughout the eons of eternity to remind Himself of His eternal promises to His eternal people? His hands were pierced for Adam’s entire race. Salvation was offered to the Jew and also to the Gentile. But, the prints of the nails may remind Him of the many needy sons of Abraham who have not yet accepted that offer. Some time in the near future the Jews will acquire the ancient site of their Temple, on Mount Moriah, in Jerusalem. After they gain this site, they will rebuild their Temple and restore the Mosaic ceremonies of Temple worship ~ daily worship services and the offerings of animal sacrifices. 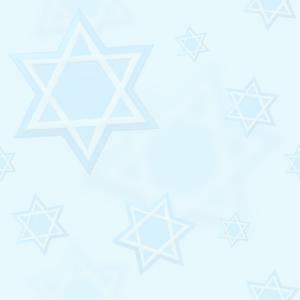 During this time anti-Semitism and other racial problems will grow increasingly severe. Jews who believe what the prophets of old taught know that their people will find life more and more difficult. "The day is coming," some of them say, "when the living will envy the dead. HaShem (God - literally meaning The Name above all names’) will not reject the prayers of the many, and will accept our prayers and hearken to our outcries with compassion and grace. He will issue a spirit of purity from Above, in order to return us to ‘Avinu sheba Shamayim’ (Our Father that is in heaven). Fathers will return to their sons and sons to their fathers. HaShem will heed us, and we will not be lost. We will merit the coming of ‘Mashiach tzidkeinu’ speedily, out of great mercy and kindness." In fact that the long simmering Jerusalem issue has now clearly risen to the top of the bitter Arab ~ Israeli conflict should act as a warning that the prophesied end of days is fact approaching. The Bible makes abundantly clear, especially in Zechariah 12 that the city will be at the centre of history’s final military conflict. Israel will be given a new name~~~ The nation will be called Hephzibah (my delight is in her) and the land Beulah (married)! "Thou shalt no more be termed Forsaken; neither shall thy land any more be termed Desolate: but thou shalt be called Hephzibah, and thy land Beulah: for the Lord delighteth in thee, and thy land shall be married" (Isaiah 62:4). The Bible contains an exciting beginning and an unforgettable end, like any good book should. The beginning was CREATION. The end will be destruction but then RECREATION. In fact, God’s Word has a very happy finale, at least for those who know the Lord. The sin soaked earth will be reborn. The final period of history ~ when the prophesied man of lawlessness will gain control over the world, a Jerusalem temple will be built, intense warfare will engulf the Middle East and the saints will be caught up to meet the Messiah in the air.